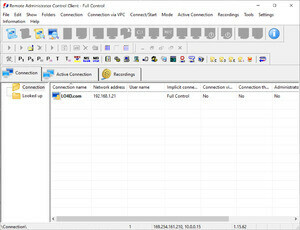 Remote Administrator Control Client is a remote desktop control program which connects to computers running the server counterpart. The application is easy to setup and features an interface which offers a number of options. Namely, you can select between several modes like full control, read only access, file transfer and command prompt access. You can also use the client application to control to record screen activity, shut down remote systems and chat with users. Version 5.0.3.0 is a freeware program which does not have restrictions and it's free so it doesn't cost anything. For security reasons, you should also check out the Remote Administrator Control Client download at LO4D.com which includes virus and malware tests. Additional screenshots of this application download may be available, too.